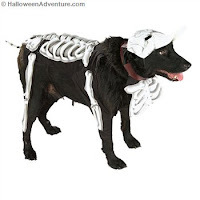 This Halloween, take your four legged friend out for a spin in one of our fabulous pet costumes. Big fan of Dark Knight? 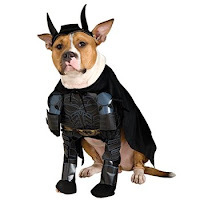 Well, give your puppy a matching costume this holiday with our Batman Dark Knight Pet Costume! Make life "ruff" for the Joker with this cool Batman: The Dark Knight Batman pet costume. Make no bones about it, Joker, this heroic hound is ready to sink his teeth into adventure! Looking for something a bit funnier? 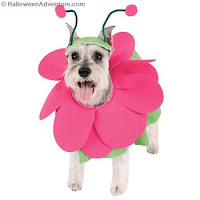 Dress your pooch in our Bloomin’ Snout Pet Costume. This one features a giant foam neckpiece that resembles a large pink flower and even comes with a headpiece with antennae. Adorable! Give ‘em something scary with our Corpse Bride Pet Costume. This one is freaky and fabulous and will give all the other neighborhood dogs a run for their money. Polyester costume with molded plastic bones attached. Ever heard of Pickles the Firecat? Well, it’s a popular children’s book about a cat who saves the day! While we don’t offer many cat costumes, we do have a fireman costume for your pup. Our Firemutt Pet Costume is perfect for pooches that love to save the day. It includes a black and yellow shirt and yellow fire hat. 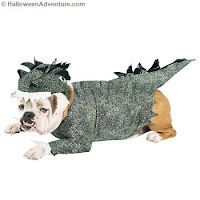 Badass puppies will love our Jurassic Bark Pet Costume. This getup turns your little doggie into a giant, scary dinosaur reminiscent of those in Jurassic Park. Features a jumpsuit with black and white dino scales, as well as a hood that resembles a dino head. Looking for luck in all the wrong places? Well, that’s probably because you haven’t gotten your dog our Lucky Dog Pet Costume. This costume includes a yellow tunic with all kinds of lucky goods including dice, a horseshoe and four-leaf clover. Tonight might be the night to play the lottery! For more pet costumes, check out our pet costume section online!